It experience was as incredible as I’d expected it to be. BT Tower (previously, the Post Office Tower) was once the tallest building in the UK. Officially opened in October 1965, it was built to provide London with microwave communication links to the rest of the country. Interestingly, this icon of the London Skyline was, apparently, an Official Secret for its early life. In theory, you couldn’t admit it existed. It originally opened with a rotating restaurant operated by the Butlins holiday company. I wonder how you made a booking if you couldn’t say where it was? For security reasons public access, including the restaurant, closed in the early 1980s. In the mid 1990s, when I worked for the audio distribution company, SMS, we had audio circuits connecting our satellite network to ‘Tower’ to allow us to send – and receive audio from – BT’s broadcast network. We were based only a 9-minute walk away from the tower with a perfect line of sight (if we leaned out the front door). We didn’t use the circuits very often but there was always a little excitement when we called BT to arrange a connection. 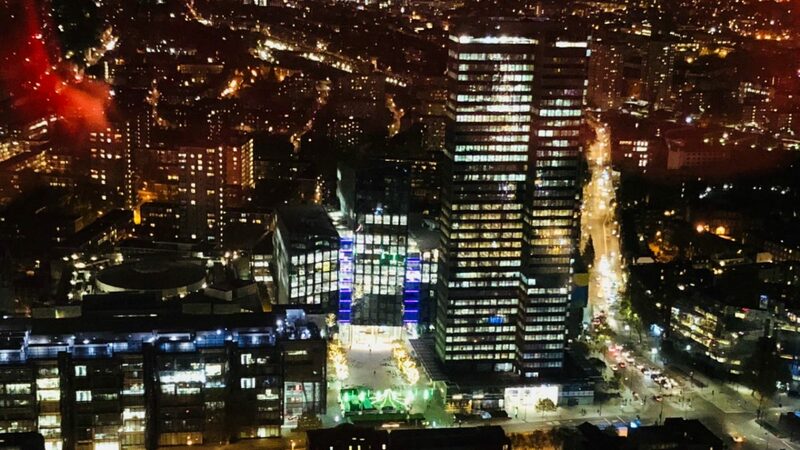 Years later, I was back in the Euston Tower for work which provided a birds-eye view of the rotating screens. By then, many of the dish-shaped aerials had been removed for safety reasons but the Tower was still at the heart the UK’s broadcast network even if the signals had migrated to underground fibre cables. And even now, at least until we move offices at the start of December, I walk along Tottenham Court Road every morning past Maple Street, the Tower’s official address, with a daily view of whatever message is set to appear on the big screen 167m (548 ft) up in the London sky. I’ve been to the top of many buildings with a birds-eye view of London but, until last week, I’d never been to the top of the Tower. The charity RedR arranged an evening of visits as a fund-raising activity so I got to look backwards to my former, and current, work places. While at the top of The Tower, they turned the rotation on for a full sweep of the London skyline which, at night, is very impressive. 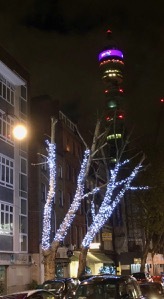 As we are in the season of Christmas lights, there were some spectacular views of the lights along Tottenham Court Road, at Regent’s Place and of the Hyde Park Winder Wonderland. It experience was as incredible as I’d expected it to be. According to the London Landmarks site, the Tower is the “only building in the country which is allowed to be evacuated by lift (an oddity which required Parliamentary legislation to be passed)”. Fortunately, an evacuation was not required this evening. A few more pictures from the visit to BT Tower on Flickr. #SOLS is the project to have something written on this site on the last Sunday of every month. I covered topics such as a visit to Japan, the state of the trains and why we change the clocks. I have one more expected in 2017 at the end of the year. I wonder what that will cover? Follow the sequence with handy sols tag.